Our skilled team of kitchen design specialist will develop several designs of your kitchen space so you can see all options and know you are making the best choice for your home. Performance Kitchen Design Center, conveniently located in downtown Manayunk, has over 100 door styles and finishes, tile, granite, flooring and hardware choices as well as Kitchen and bathroom displays. Kitchen design is what Performance Kitchens & Home specializes in. 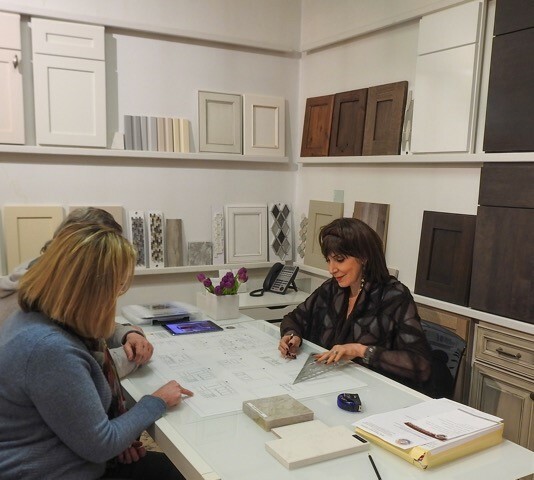 Here, Nancy Forman consults with a new client on what they want for their new kitchen design. We offer color rendering services, this helps you see exactly what your kitchen will look like from every angle and finish giving you the opportunity to make changes before the cabinetry is ordered. Our plans are very detailed and make every aspect of the installation smooth and hassle free. We provide you with a budget guide at the beginning of the design stage and re-evaluate it during the process. We know there are so many choices that can increase your price so on every job we will present cost savings options to keep you on track. Our Design team is ready help you see your vision and guide you through the entire process! Best of Houzz 2014-2018 View our 67 Kitchens, Baths and More on Houzz. Performance Kitchens & Home has been re-inventing spaces for Kitchens, Bathrooms, Laundry, Den, Family Rooms… any room in the home that needs creative design solutions. Performance Kitchens is the finest Kitchen Design Specialist in Philadelphia and the Main Line.